Game day parties, office parties, birthday parties, holiday parties … we know how to throw a party. Let us take care of all the delicious details! Our coal-fired, family-style catering will be the hit of any event – big or small! The Coal-Fired Difference. Like nothing you've ever tasted, our coal-fired specialties are served straight out of our 800-degree oven; cooked to perfection and bursting with flavor. A delicious combination of always fresh (never frozen), authentic recipes, makes Anthony's a fan favorite. Visit today and experience the craveable coal-fired difference. Served with caramelized onions and Focaccia bread. Large meatballs slowly cooked in our tomato sauce. Choice of Protein: Chicken $4, Roast Beef $4, Meatballs $4, Italian Tuna Salad $4. Fresh Mozzarella and sliced tomatoes with sweet peppers, Olive Oil and Basil. Thinly sliced and served with our fresh tomato sauce, Romano cheese, and Focaccia bread. Bitter Italian greens, sautéed in garlic and olive oil, served with our Italian sausage and Focaccia bread. Roasted in our coal oven with garlic, Rosemary, spicy vinegar peppers and white wine, served with Focaccia bread. Fresh Mozzarella, Prosciutto, vine ripe tomatoes and arugula, served on Focaccia bread with our Italian Vinaigrette. Lemon, olive oil, tomato, and arugula, served on Focaccia bread with our Italian Vinaigrette. Romaine lettuce and tomato, served on Focaccia bread with our Italian Vinaigrette. Marinated Chicken breast topped with Prosciutto, roasted red peppers, melted Mozzarella on a bed of arugula, served on Focaccia bread with our Italian Vinaigrette. Marinated chicken breast topped with Broccoli Rabe and Mozzarella cheese and served on Focaccia bread. Meatballs, melted Mozzarella cheese and long hot finger peppers served on Focaccia bread (We suggest getting the sauce on the side as this sandwich can get soggy). Mozzarella and Ricotta. Additional Items: Italian Sausage, Mushrooms, Kalamata Olives, Prosciutto, Long Hot Finger Peppers, Anchovies, Onions, Pepperoni, Sweet Peppers ($1.99 each). Grande Mozzarella, Romano Cheese, and our sauce made of Italian Plum Tomatoes, Olive Oil, and Basil. Add Toppings: Italian Sausage +$1.99, Mushrooms +$1.99, Kalamata Olives +$1.99, Prosciutto (comes uncooked unless otherwise specified) +$1.99, Long Hot Finger Peppers +$1.99, Anchovies +$1.99, Onions +$1.99, Pepperoni +$1.99, Sweet Peppers +$1.99, Extra Cheese +$1.99, Sliced Tomatoes +$1.99, Ricotta +$1.99. Fresh Mozzarella, sliced tomato & basil. No sauce. Add Toppings: Italian Sausage +$1.99, Mushrooms +$1.99, Kalamata Olives +$1.99, Prosciutto (comes uncooked unless otherwise specified) +$1.99, Long Hot Finger Peppers +$1.99, Anchovies +$1.99, Onions +$1.99, Pepperoni +$1.99, Sweet Peppers +$1.99, Extra Cheese +$1.99, Sliced Tomatoes +$1.99, Ricotta +$1.99. Fresh Mozzarella and plum tomato sauce, topped with grated Romano cheese and fresh basil. Add Toppings: Italian Sausage +$1.99, Mushrooms +$1.99, Kalamata Olives +$1.99, Prosciutto (comes uncooked unless otherwise specified) +$1.99, Long Hot Finger Peppers +$1.99, Anchovies +$1.99, Onions +$1.99, Pepperoni +$1.99, Sweet Peppers +$1.99, Extra Cheese +$1.99, Sliced Tomatoes +$1.99, Ricotta +$1.99. Ricotta, Mozzarella, and Romano cheese. Add Toppings: Italian Sausage +$1.99, Mushrooms +$1.99, Kalamata Olives +$1.99, Prosciutto (comes uncooked unless otherwise specified) +$1.99, Long Hot Finger Peppers +$1.99, Anchovies +$1.99, Onions +$1.99, Pepperoni +$1.99, Sweet Peppers +$1.99, Extra Cheese +$1.99, Sliced Tomatoes +$1.99, Ricotta +$1.99. Top Round steak, marinated and served with our caramelized onions. Add Toppings: Italian Sausage +$1.99, Mushrooms +$1.99, Kalamata Olives +$1.99, Prosciutto (comes uncooked unless otherwise specified) +$1.99, Long Hot Finger Peppers +$1.99, Anchovies +$1.99, Onions +$1.99, Pepperoni +$1.99, Sweet Peppers +$1.99, Extra Cheese +$1.99, Sliced Tomatoes +$1.99, Ricotta +$1.99. Thin sliced eggplant, layered with our fresh tomato sauce then topped with grated Romano cheese and fresh basil. Add Toppings: Italian Sausage +$1.99, Mushrooms +$1.99, Kalamata Olives +$1.99, Prosciutto (comes uncooked unless otherwise specified) +$1.99, Long Hot Finger Peppers +$1.99, Anchovies +$1.99, Onions +$1.99, Pepperoni +$1.99, Sweet Peppers +$1.99, Extra Cheese +$1.99, Sliced Tomatoes +$1.99, Ricotta +$1.99. Baby meatballs over our Traditional Pie. Add Toppings: Italian Sausage +$1.99, Mushrooms +$1.99, Kalamata Olives +$1.99, Prosciutto (comes uncooked unless otherwise specified) +$1.99, Long Hot Finger Peppers +$1.99, Anchovies +$1.99, Onions +$1.99, Pepperoni +$1.99, Sweet Peppers +$1.99, Extra Cheese +$1.99, Sliced Tomatoes +$1.99, Ricotta +$1.99. Meatballs, sausage, hot or sweet peppers and Ricotta cheese. Add Toppings: Italian Sausage +$1.99, Mushrooms +$1.99, Kalamata Olives +$1.99, Prosciutto (comes uncooked unless otherwise specified) +$1.99, Long Hot Finger Peppers +$1.99, Anchovies +$1.99, Onions +$1.99, Pepperoni +$1.99, Sweet Peppers +$1.99, Extra Cheese +$1.99, Sliced Tomatoes +$1.99, Ricotta +$1.99. Bitter Italian greens, sautéed in garlic and olive oil served,served with our Italian sausage over a Traditional Pie. Add Toppings: Italian Sausage +$1.99, Mushrooms +$1.99, Kalamata Olives +$1.99, Prosciutto (comes uncooked unless otherwise specified) +$1.99, Long Hot Finger Peppers +$1.99, Anchovies +$1.99, Onions +$1.99, Pepperoni +$1.99, Sweet Peppers +$1.99, Extra Cheese +$1.99, Sliced Tomatoes +$1.99, Ricotta +$1.99. An arugula salad served over our Traditional Pie. Add Toppings: Italian Sausage +$1.99, Mushrooms +$1.99, Kalamata Olives +$1.99, Prosciutto (comes uncooked unless otherwise specified) +$1.99, Long Hot Finger Peppers +$1.99, Anchovies +$1.99, Onions +$1.99, Pepperoni +$1.99, Sweet Peppers +$1.99, Extra Cheese +$1.99, Sliced Tomatoes +$1.99, Ricotta +$1.99. [Cannot Be Modified]. Roasted cauliflower with olive oil and garlic, Romano and Mozzarella cheese, topped off with bread crumbs. Add Toppings (except Personal Roasted Cauliflower Pizza): Italian Sausage, Mushrooms, Kalamata Olives, Prosciutto (comes uncooked unless otherwise specified), Long Hot Finger Peppers, Anchovies, Onions, Pepperoni, Sweet Peppers, Extra Cheese, Sliced Tomatoes, Ricotta ($0.79 each). Grande Mozzarella, Italian plum tomatoes, Romano cheese, basil and olive oil. Fresh Mozzarella, sliced tomato & basil. No sauce. Fresh Mozzarella and plum tomato sauce, topped with grated Romano cheese and fresh basil. Ricotta, Mozzarella, and Romano cheese. Top Round steak, marinated and served with our caramelized onions. Thin sliced eggplant, layered with our fresh tomato sauce then topped with grated Romano cheese and fresh basil. Baby meatballs over our Traditional Pie. Meatballs, sausage, hot or sweet peppers and Ricotta cheese. Choice of Peppers: Hot Peppers, Sweet Peppers. Bitter Italian greens, sautéed in garlic and olive oil served, served with our Italian sausage over a Traditional Pie. An arugula salad served over our Traditional Pie. [Contains Eggs] Thinly sliced and served with our fresh tomato sauce, Romano cheese, and Focaccia bread. Roasted cauliflower with olive oil, garlic, and crushed red pepper (cannot be modified). Fresh Mozzarella, sliced tomato & basil. No sauce. Add Toppings: Mushrooms +$1.99, Kalamata Olives +$1.99, Long Hot Finger Peppers +$1.99, Anchovies +$1.99, Onions +$1.99, Pepperoni +$1.99, Sweet Peppers +$1.99, Extra Cheese +$1.99, Sliced Tomatoes +$1.99, Ricotta +$1.99. Comes with our homemade Italian Vinaigrette. Grande Mozzarella, Romano Cheese, and our sauce made of Italian Plum Tomatoes, Olive Oil, and Basil. Add Toppings: Mushrooms +$1.99, Kalamata Olives +$1.99, Long Hot Finger Peppers +$1.99, Anchovies +$1.99, Onions +$1.99, Pepperoni +$1.99, Sweet Peppers +$1.99, Extra Cheese +$1.99, Sliced Tomatoes +$1.99, Ricotta +$1.99. Bitter Italian greens, sautéed in garlic and olive oil and served with Focaccia bread. A Special Prix Fixe Menu for $40. Guests can enjoy 4 courses including salad, appetizer, entree and dessert served family style. Wings were too well done. Pizzas were very burnt on bottom and edges . Sausage was barely visible as an add on to a pizza. Service was good. Price was on the high side. Would not recommend to anyone. Will not be back. Place needs upgraded. Front right just seemed like a bunch of unused tables stacked together. Back right just odd use of space. Not the most inviting layout. 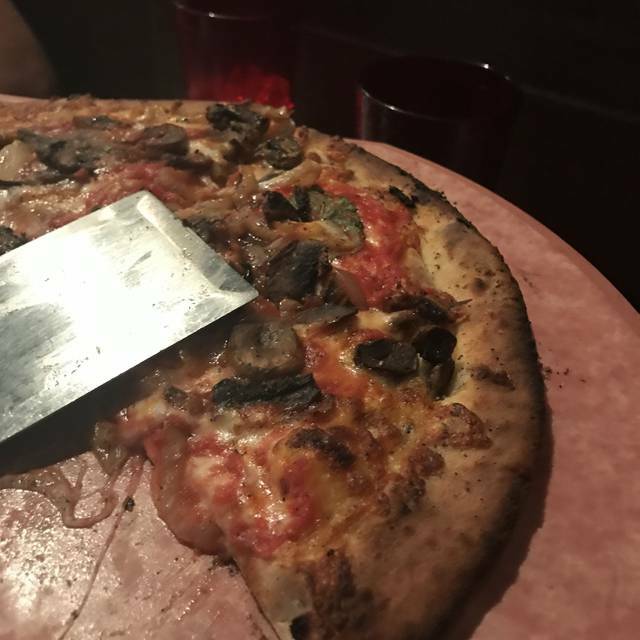 Pizza is expensive vs other local places with much better atmosphere. Waiter was great. Made reservations for 5:15, seated at 5:15 on very busy night (all seats in use). Waiter came right away for drinks, and wing appetizer (PLEASE Bring back the dry rub which seems to be no longer available). Out of Pasta Fagioli Soup on a Saturday afternoon(Shouldn’t be), suggest adding a Soup of the day as well. Timing between order and serving perfect. Waitress on the ball and very nice young lady. All food very good at reasonable price. ❤️ Anthonys - tried the Paule pizza this time and loved it. We waited over 45 minutes for our pizza. It was not very busy, there were at least 6 servers and 4 tables, but our server was not very attentive. I had my 3 year old grandson, she didn’t offer a booster seat and when I requested a cup with a lid, it seemed like she was a bit put out. Service is a big deal and it seemed like it was too much to ask. My boys were home from college and wanted a good pizza, so...Anthony’s pizza is always great, however, this particular day, the waitress totally sucked! We asked for water, one cup, then asked again, then a second cup until our 4th request! Then same for napkins, and same for utensils...the poor busboy had more sense than our dimwit waitress and ended up providing plates, napkins, etc! I was so annoyed and wanted to enjoy the time that I had with my family. Hope it was a one time only experience (hopefully this lazy waitress found some other establishment in which to lack off and totally ignore patrons and why she even showed up, ugh). Reservation for 7:15, seated at 7:15. Immediate server taking drink orders, served within five minutes. Ordered the wings “great” for appetizer, very reasonable wait, wings outstanding, no deep fried grease here! Ordered meatballs, salads, and pizza for main meal. Again very reasonable wait time, all food well prepared and very good. Server stopped by several time for refills and plate clearing. Restaurant was near full on this Friday evening. Will return for outstanding service and food at a reasonable price. Waitress was horrible. Took forever to get drinks and for food to come out. Family size salad was as great as ever! Our pizzas came quickly and everyone was happy with their meal.